Jaguar Moon is a new release from Novomatic. It’s an allplay slot that’s set right in the heart of the jungle. Jungles, or rainforests as they’re otherwise known, contain half of the world’s wildlife! They’re full of exotic plants and animals, some of which you can see in Jaguar Moon. Jaguars are wild cats that live in the jungles of Central and South America. They’re the third largest cat in the world! They look a lot like leopards, only they’re bigger and more powerful. Novomatic’s newest slot game stands right in the heart of jaguar territory. The jaguar used to be revered by the ancient Aztecs and Mayans. In fact, some ancient treasure from these civilisations, depicting jaguars, can be found in this video slot! The reels are made out of pure Aztec gold. The golden reels are very ornate and they’re carved in Mayan style. These precious reels are hidden in the thick of the jungle. The vegetation is dense and hardly any moonlight reaches the jungle floor! You can see a few fireflies flying around the jungle, lighting up the ferns and the shrubs. 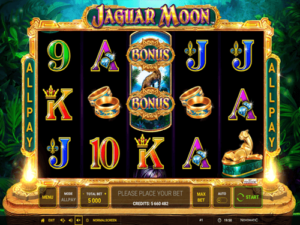 In addition to the fact that Jaguar Moon is an allplay slot, Jaguar Moon also has Free Spins. All Free Spins given in Jaguar Moon have win multipliers, which make them all the more desirable! You can read about and play other similar or various slot games to Jaguar Moon here at NovomaticCasino.co.uk. Have a look at: Wild Thing, Jungle Queen, Temple of Secrets, Mayan Moons and Ancient Forest. What’s Lurking in This Jungle? In this Novomatic jungle, the jaguar prowls its territory and searches for prey! Jaguars are very good at hunting and have been known to dine on capybara, deer, monkeys, caimans, turtles and even bears! In Jaguar Moon, you are the predator and you’ll be on the hunt for matching symbols. This is the way to win in any slot game! You can spin the reels manually or automatically. Where they stop is what counts! You want to see as many matching symbols as possible. Because Jaguar Moon is an allplay Novomatic casino slot, any consecutive combination is a win! The minimum number of identical symbols you need is 3. Any consecutive line of 3, 4 or 5 matching symbols will give a win, as long as they land from the left. Every line is a payline in this slot! Some symbols are more valuable than others, and therefore give bigger payouts! The 9, 10 and Jack symbols are worth the least. The other card symbols, the Queen, King and Ace, are worth slightly more. The golden rings and the golden necklace give medium-sized payouts. Both are decorated with jaguar-inspired art! The golden jaguar ornament pays out big bucks. Far in the lead, however, with the absolute biggest wins in the entire game is the beautiful Queen of the jungle! She has jet black hair and eyes and she’s absolutely gorgeous! She pays up to 80x your bet! Compared with the 9, 10 and Jack with pay up to 4x your bet. The Jaguar is a wild animal and the wild symbol! It can complete any win, except a bonus win. In Jaguar Moon, you can win Free Spins with the bonus symbol! The bonus symbol is hard to miss! It’s a beautiful jaguar in her natural habitat, with the word bonus written in gold! The number of free spins you get depends on how many of these bonus symbols you get and how they are positioned. 3 bonus symbols in the right positions give 8 Free Spins with a x2 multiplier. 4 bonus symbols give 12 Free Spins plus a x3 win multiplier. 5 bonus symbols award 15 Free Spins with x4 win multipliers. 6 bonus symbols trigger 20 Free Spins which come with a x5 win multiplier! See the paytable for the positioning of the bonus symbols. Whichever multiplier you win from the Bonus symbols will be applied to all of your wins in the Free Spins! You can gamble your Free Spins wins, just like your ordinary wins. In Jaguar Moon, the gamble game is a card game. You have to guess the colour of the next card in the pack (red or black). It’s as simple as that! Guess right and you’ll double your win. Guess wrong and you will lose it.